Since June of 1988, the District's Flash Flood Prediction Program (F2P2) has operated from the Diamond Hill Office Complex at 2480 West 26th Avenue in Denver. In fall of 1998, Henz Meteorological Services (HMS) chose to move their business from this location to Littleton. This gave the District an opportunity of secure dedicated office space at Diamond Hill for future F2P2 operations. This represents a fundamental change for the District, considering that the F2P2 has operated from the offices of the private meteorologist since its start in 1979. The program's satellite downlink system, emergency power generator and other existing rooftop communications equipment at Diamond Hill factored heavily in the District's decision to develop a more permanent Flood Prediction Center. Remodeling of the 1,119 square-foot FPC in Suite 310-B was recently completed. The FPC will continue to be staffed by a private meteorologist during the flood season from 15-April through 15-September. HMS provided the forecasting services for 1999. Like many other Millenium-frustrated computer owners, Y2K is forcing the District to make some significant changes to the ALERT system. Since the first IBM PC/XT base station was purchased by the District in 1985, a UNIX-like operating system (OS) known as QNX has been in use. This highly reliable OS has evolved over the years to accommodate new computer technologies, but its basic design has remained essentially unchanged. The popularity of Internet TCP/IP communications and the desire by software developers to make the "old-reliable" OS more UNIX compatible, has lead to its obsolescence. Consequently, the District will be replacing QNX-2 with the "new improved" QNX-4 system. It was not surprising to learn that, in addition to the OS upgrade, some other costly software changes would also be required--specifically, the ALERT database/display software. While this may sound relatively simple, consider the following facts: 1) the existing 15-year-old database and archive files must be converted to a new format; 2) many existing custom features must be individually revised; and 3) maintaining a similar "look and feel" is desirable to minimize operator retraining needs. It should be clear that we do have a major project ahead. One irony in all of this is that the existing QNX-2 operating system is entirely Y2K-compliant. Computer hardware upgrades are also necessary since all seven District-supported base stations currently use 486 processors and other components that are not Y2K-compliant. Considering the software challenges mentioned above, replacing the hardware appears the easy part. A new flood detection network (FDN) is being considered for southwest Denver in the vicinity of Marston Lake. The preliminary investigation for this ALERT expansion project should be completed by summer 2000 with implementation funding possible before yearend. ALERT Mesonet growth continued in 1999. Additional weather stations are also planned for 2000. 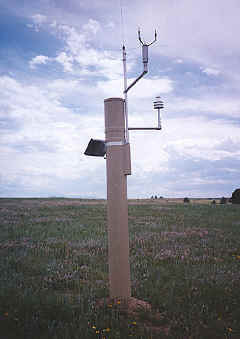 The newest weather station in this network was installed near Elbert in June. This platform incorporates new sonic wind sensing technology with no moving parts. 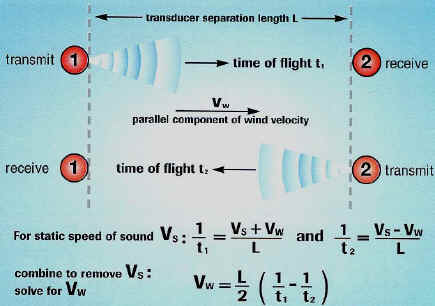 The figure illustrates the physical science principles and mathematics used to calculate wind speed. 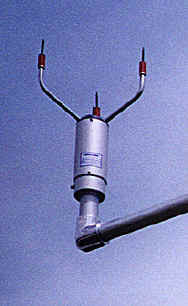 Traditional spinning-cup anemometers and wind vanes use bearings that require periodic replacement and it is difficult to detect when these instruments are failing. Thus far, the wind data collected from the Elbert station appears quite good. A second sonic anemometer will soon be operating at a new weather station site on Squaw Mountain in Clear Creek County south of Idaho Springs. The Denver Department of Environmental Health recently asked the District to help install an ALERT weather station at The Urban Farm at Stapleton as part of the District's regional gaging network. The Urban Farm occupies the building formerly used by National Weather Service. The NWS forecast office was relocated to Boulder in May of 1998. The DEH will provide 100-percent of the funds needed to purchase and install the station. The District will assist DEH with future maintenance. The Urban Farm's mission is to teach agricultural and environmental education to children, youth and their families though links with schools from Denver and the surrounding area. Learning modules will include studying floodplain management practices, land use controls, how urban growth impacts stormwater quality, and the affects of urban development on streamflow and flooding. The idea of having access to weather data from the entire ALERT mesonet was very attractive to the project. This will also be a new learning experience and educational outreach opportunity for the District. Counting the Urban Farm weather station and the possibility of another weather station near Marston Lake, the ALERT mesonet is expected to grow to 17 stations by the end of 2000. The District ALERT base station logged over 3900 modem connections during 1999 representing over 2200 hours of connect time. These numbers reflect a slight downward trend compared to the previous years record of 4900 logins/3500 hrs. This may be indicative of the milder flood season that we experienced, or it may be that users are beginning to prefer the Internet access alternative found at 'alert.udfcd.org'. The District provides local government agencies and certain other cooperators with free dial-up access to the base station. With network communications and web browser usage part of our daily routines, ALERT users can expect the District to continue improving Internet capabilities in 2000. Certain parts of Colorado were declared federal flood disasters during 1999. La Junta in Otero County was hardest hit when spring floodwaters from the Arkansas River overtopped flood control levees causing damage to more than 200 homes. Eleven other Colorado counties were later added to the federal disaster list. District local governments once again avoided flood "disaster" but did not make it through the flood season completely unscathed. As usual, localized flood damages occurred in the Denver area on a number of days this past year. The following briefly describes some of the more notable events. On April 30 and May 1, the NWS issued flood watches for the South Platte River and other large Denver area streams. Gradual rises in river stage were observed due to relatively high rainfall accumulations over the prior week. ALERT rain gages in Boulder County had 7-day rainfall totals approaching six inches, but fortunately no high intensity rains occurred during this period. Englewood Dam recorded a record high water depth of 16.2 feet on April 30. Spillway flows begin at a depth of 40 feet. Flood control improvements to this District-owned, normally dry detention dam were completed in 1976. The ALERT station for this site has been in operation since June 11, 1987. This was the first flash flood threat day of the 1999 flood season, with the Carr Street gage on Ralston Creek in Arvada providing one of the verification statistics (see table for annual peak). Ralston Creek did overtop its bank in places but no major flood damages resulted. Heavy rain also occurred in Denver at a number of locations. The first Message 1 internal alert was issued by HMS at 2:29 PM, followed 30 minutes later by a Red Flag update message. Winter appeared to have returned to southern Douglas County when an intense storm brought 8 to 12 inches of hail to the headwaters of Cherry Creek near Franktown and Larkspur. A warehouse roof collapsed injuring three workers while two dozen others escaped uninjured according to the Rocky Mountain News. While heavy rain and hail caused some minor street flooding in the metro area, the District was not impacted by the Douglas County storm. Messages were issued by HMS at 12:47 PM alerting District counties of the potential for one-inch rains lasting 30 to 45 minutes accompanied by 1" diameter hail between 2:00 and 10:00 PM. Aurora received the heaviest rain amounts causing problems for some local drainage facilities. The Sable Ditch rain gage exceeded its alarm threshold three times during the storm. A maximum intensity of 5.67"/hour was measured at 3:16 PM during the 90-minute event which produced 1.61" of rain. Small hail also hindered storm drainage system performance and may have caused some gages to underestimate rainfall. A massive rain-induced landslide near the headwaters of Clear Creek marked the second anniversary of Fort Collins flash flood disaster. The slide covered I-70 with more than 25 feet of mud east of the Eisenhower Tunnel causing the interstate highway to be closed for 25 hours. At least five other road closures were also caused by mudslides elsewhere in Colorado. In the Denver area heavy rains were measured at a number of gages with the higher amounts being reported in Aurora (1.73" at Side Creek Park) where alarm thresholds were exceeded at 4 sites. July 28 also represents the first NWS flash flood watch issuance of the year affecting the District. The NWS watch was issued shortly after 4 PM prior to the occurrence of heavy rain. Rains near Georgetown caused two minor mudslides forcing closure of I-70 for the second time this week. In Denver and Aurora, street flooding kept public works and police departments busy. Martin Luther King Blvd. in the Park Hill area of Denver was barricaded due to flooding between Colorado Blvd. and Quebec Street. However, this measure did not stop six motorists from driving into the flooded area and stalling. In Aurora, water was above the curbs at a number of major intersections. Sand Creek recorded its annual peak while the Havana Park detention facility in the Westerly Creek basin overflowed into neighborhood streets. Flash flood warnings were issued for parts of Jefferson and Boulder County outside the District. The ALERT system measured its highest rainfall amount of 1.77" in the mountains of Boulder County between Nederland and Ward. Thunderstorm rain in Denver and Aurora exceeded one inch at 8 gaging stations with 1.69" occurring at Horseshoe Park in Aurora. This day marks the 23rd anniversary of the Big Thompson Canyon flash flood that killed 145. Few will argue that this was the worst flood day of the year for the District with Massey Draw in Jefferson County being one of the hardest hit areas. A District construction project at Carr Street received considerable damage along with five homes in the area. North of Denver high water closed I-25 between 104th and 144th Avenues. At U.S. 36 and I-25, a Toyota dealership was flooded ruining 45 cars with damages estimated at $500,000. U.S. 36 was nearly impassible at Federal Blvd. where mud-clogged storm drains made matters worse. CDOT maintenance crews were out until after midnight Thursday cleaning up U.S. 36. A mobile home park along Niver Creek near 92nd and Pecos had 5 feet of water flowing through it around 4 PM. M. Scott Carpenter Middle School near 70th and Mariposa reported 6 feet of water in the building. The school is located near Kalcevic Gulch in Adams County. In Boulder County runoff from heavy rains damaged roads in Eldorado Canyon State Park along South Boulder Creek. The NWS said that 2 to 3 inches fell in Westminster and Federal Heights in 90 minutes. The storm activity began around 3 PM, just before rush hour. Composite photo taken August 5 looking downstream at Massey Draw from Carr Street in Jefferson County. Road maintenance crews helped direct water toward the channel during the storm by constructing a temporary earth dike across street. The ALERT system reported rainfall totals not representative of the flooding that occurred. Boulder County gages recorded the highest 24-hour amounts with six mountain stations exceeding 3 inches. There are no automated gages in the Massey Draw area, nor along Kalcevic Gulch or the northern portion of I-25. The ALERT map display shows 7-hour rain totals ending at 11:30 PM. The larger numbers noted as "obs" were obtain from the NWS and other observers in and surrounding the Massey Draw drainage basin. Henz Meteorological Services was hired by the District to reconstruct the Massey Draw storm using archived radar data and rainfall estimating techniques that they developed for predicting flood potentials. The figure, taken from the HMS report, shows 1/2 miles square grids positioned over the Massey Draw basin with estimated rain depths for the storm period between 4:30 and 6:30 PM. The rain activity actually lasted 6 to 8 hours and HMS estimates that the maximum rain depth may have exceeded 7 inches for that period. Fortunately, most of the storm was characterized by relatively low rain intensities or the flooding would have been much worse. The peak discharge estimated for Massey Draw at Carr Street from high water surveys indicated that the event was much less than a 100-year flood, more on the order of a 10-year event. Given the flood problems from Wednesday and the highly saturated ground conditions over much of the District, the NWS issued a flash flood watch lasting from noon through 10 PM. While the Denver metro experienced a few localized storms, Bear Gulch in the Box Elder Creek basin east of DIA was hardest hit by flooding. A dog kennel near E. 88th Ave. and Imboden Road in Adams County was flooded and a number of animals were killed. The District had Leonard Rice Consulting Water Engineers obtain high water measurements for this flood. The highest rain measured in the metro area was at Westwoods in Arvada where 1.02" fell. The Wheat Ridge Municipal Building and Police Station experienced minor flooding when parking lot runoff exceeded storm drain capacities and entered the building around 4:30 PM. The problems were caused by a very intense short duration storm that swept through the area, accompanied by high winds downing large tree limbs. A nearby ALERT station (Upper Sloan Detention Basin) measured an unimpressive rainfall total of 0.47", but the storm lasted only about 6 minutes. The storm's high intensity was estimated to be a 10 to 20-year event at this location. Elsewhere in the Denver area, more than 3 inches was reported to have fallen in less than an hour. The highest ALERT rain measurement was 2.52", near I-225 and Sand Creek in Aurora. In addition to the wind and rain, hail and lightning caused problems for many areas including DIA. The earliest HMS messages were issued for Jefferson, Boulder and Douglas Counties before noon. The 1:30 PM all District counties were notified of the potential. Only one flash flood warning was issued by the NWS during 1999 that affected the District, and it happened on this day at 5:21 PM. The warning specifically mentioned East Toll Gate Creek in Aurora and was based on a 3.5" Doppler Radar estimate from a stationary storm over a 60 to 90-minute period. The ALERT system recorded a maximum measurement of 1.69" at Side Creek Park south of Buckley ANG Base. Further upstream, amounts of 1.30" and 1.42" were measured. Local newspapers contained reports of minor street flooding along Gun Club Road between E. Quincy and E. Mississippi Avenues. From the data available, it appears that the Radar may have overestimated rainfall for this storm by a factor of two. Aug 10/15:41 Westerly Creek at Montview Blvd. 1999 Peak Flows. The table lists some of the more notable peaks measured by the ALERT system in 1999. During the 1999 flood season, the District's Flash Flood Prediction Program (F2P2) issued messages to local governments on 45 days (1 in April, 8 in May, 6 in June, 14 in July, 13 in August, 3 in September). On 8 of these days, the ALERT system recorded rainfall rate alarms caused by 1" amounts falling in less than one hour. On 12 other days, street-flooding rainfall rates of 1/2" in 10 minutes were measured. The only NWS flash flood warning issued within the District was for the Aurora storm of August 19. Flash flood watches were issued for July 28 and 29 and for August 5. The F2P2 has been in operation for the 21 years. ALERT data is currently available from 143 gaging stations (125 rain gages; 64 water level sensors and 14 weather stations).